The Best Broccoli Recipe on Pinterest! Is anyone else as big a fan of Pinterest as I am? I just love tagging recipes and crafts there. Recently I stumbled upon some broccoli recipes that sounded divine, so I decided to try my own broccoli recipe! I’ve been trying lot’s of broccoli recipes in an effort to get my family to enjoy it – and this was hands down the BEST recipe I’ve made with broccoli. EVER. I’ve mixed and matched some ingredients that combine awesomely! But you can change it around based on your own preferences! -You preheat the oven to 425. 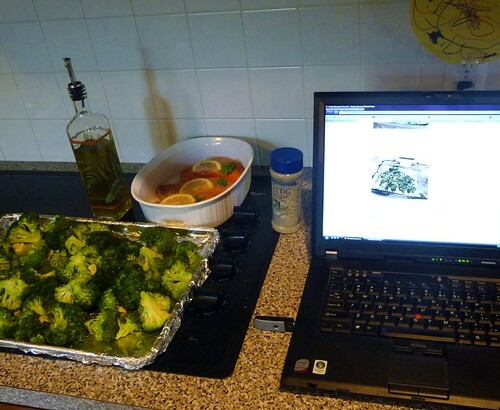 –Take 4 to 5 pounds of dry broccoli and put it on a foil covered baking sheet. –Toss with olive oil & salt and pepper. 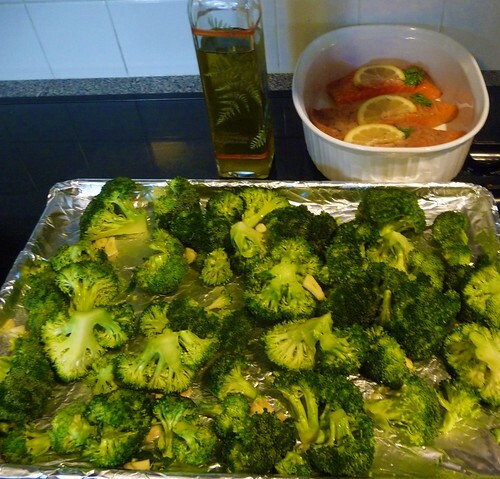 –Zest a whole lemon over the broccoli, squeezing the lemon juice all over the broccoli. In my opinion this is the MOST IMPORTANT PART! I think that the amateur gourmet has her finger on some serious magic with this recipe. I have made it 3 times since I tried it early last week! It’s that good! *One time I left the broccoli in too long in an effort to make it more crispy. It wasnt as good as when just some of the florets are browned and crisp. That does look good! My favorite veggie recipe is asparagus. A little EVOO and a pinch of salt – toss gently and put in a foil pouch – then grill until slightly brown. It is crunchy and has a grilled flavor without ever touching the grill (and falling thru the slats). YUM! Yummmm!!! I’m in love with broccoli but have never tried lemon on top of roasting it! I’m definetly going to have to now. I’ve made it before with garlic and olive oil, you can also roast the same way as you listed above but without lemon and use cauliflower! I just love the look of that whole tray full of broccoli! OH WOW!!! That does sound absolutely incredible. We aren’t big veggie eaters here…though I do love broccoli! I usually put it in the microwave with butter & seasoned with pepper…but I’m going to have to give this one a try! (other veggies we eat are corn and french cut green beans) Love potatoes, but don’t cook them much. Thanks for this wonderful recipe! Can’t wait to give it a try! I pinned that same post and just bought all the ingredients to make it. I am so glad somebody else tried it out so I could a “second opinion” 🙂 I can’t wait to try it, I’ll let you know how it turns out! Haven’t quite got the hang of pinterest, but I love what I’ve seen on there. This really does sound delicious. You had me at garlic cloves and parmesan cheese! Looks delicious! I am always on the lookout for good veggie recipes because we eat a lot of them. Thanks! I am bookmarking this one. Great site. I’ll be following you. Sounds great! My 15 month old daughter is a broccoli fanatic. I could line up any food – junk, healthy, sugary, or sweet – and she’d pick broccoli every time. Yum! I need to try that! I’ve seen that recipe! Looks so good! A friend and I are starting “Project Pinterest” where we blog about something we’ve created from Pinterest. We will start on Novemeber 3rd. Come check it out! Wow! This does sound yummy! I’m following from Mom Loop Follow Friday! This looks wonderful! We eat a ton of broccoli, and my kids love it, but Mama gets bored with it just plain steamed. @Molly, I would guess one of 3 things happened. 1) You used an extra big lemon? 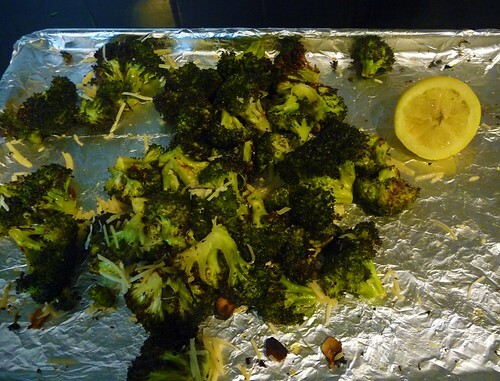 2)Perhaps you did not use enough broccoli for the amount of lemon? 3) You dont really care for the taste of lemon to begin with? Not going to lie I have never had broccoli that I could take more than a tiny bite of before being grossed out. But in an attempt to get myself and my picky boys to eat more veggies we gave this recipe a shot and I have to say it is amazing. I some how forgot the parm in my mad rush to get everything together and 5 plates on the table before the kids started eating each other but it was still so good. I will definitely be coming back to this recipe again soon!! I made less than you recipe called for and am regretting it now. Yum!! @Laura Braun, Laura- I would go for the 4 or 5 pounds called for inn the recipe, if you both like broccoli! Michelle- so glad you enjoyed it!!! @Lori, Lori- I would not recommend it in this recipe. Frozen has a much higher water content and would get soft and runny, rather than crisp and roasted.